Truckpoetry.net - official blog of Cameron Mathews: Turnips! One of the best "crops" that we've planted in the garden in recent years are purple-top turnips. Ordinarily, we plant them in the fall and they supply us with a steady stream of turnip greens throughout the winter. Sometimes, though, I not only forget to thin them out, but I also neglect pulling them up. So, as we've now hit Spring, it's time to clear out the planting beds and as part of this, the turnips had to go. 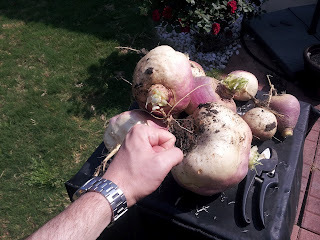 I threw my fist in there for reference as I had them sitting outside on top of the smoker, but it still doesn't give full weight to the almost-bowling-ball size of a couple of these giants. Probably way too much turnip there. 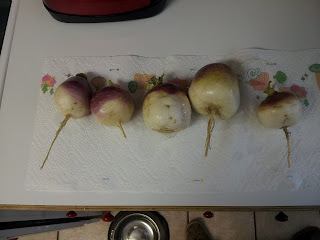 Anyway, after clearing the turnips and chunking the largest ones into the trash, we picked and cleaned up several of the more moderately sized turnips. Peeled them, then Meredith diced and boiled them to mix with some potatoes in mashers (we froze about half of them as this was still a LOT of turnips). Onward to Spring plants and planting! It's the best time for gardens!